Today’s Fabulous Friday layout is fabulous because I’m finally catching up on photos from 2009. I used a sketch from a sketch class I am taking. This was fun to do and it was good to use up some of this old CM paper I’ve had hanging around! I love this border. 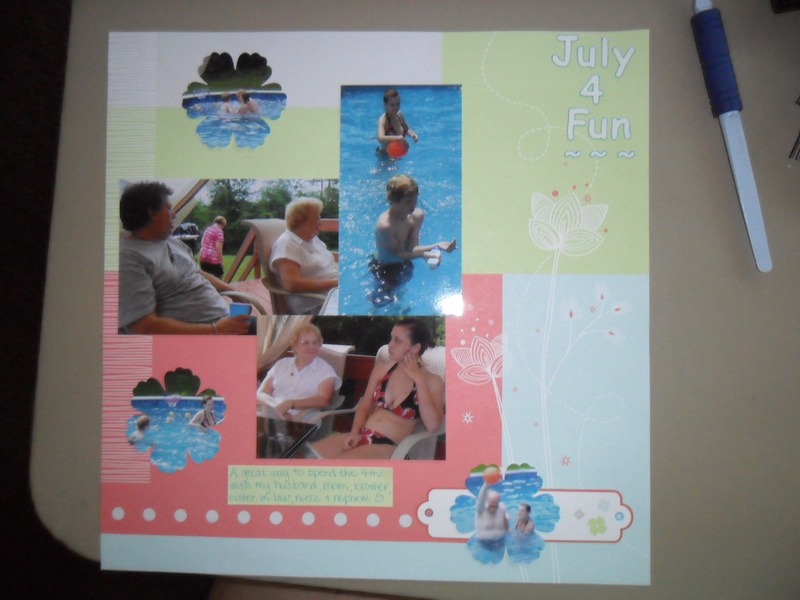 I used the square maker/punch to cut the squares – 6 white 1″ squares and 6 blue 1.25″ squares. I placed the white on the blue then cut the sun stickers in quarters and set them in each corner of the white square. 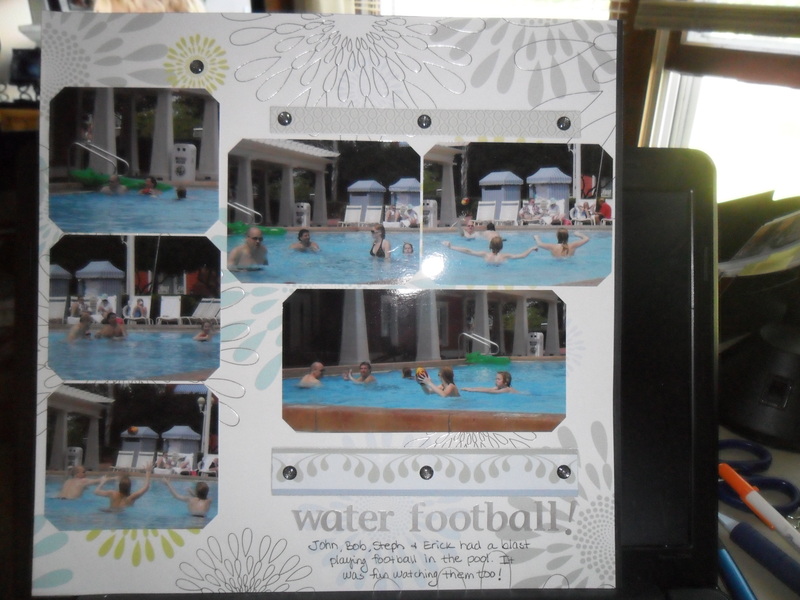 I had a sticker strip of wavy water that I cut into 1″ lengths and placed them on the bottom of the white squares. I cut a lighter blue strip 12″ x 2″. And I cut a strip of the same color that I used for the larger squares 12″ by .5″. 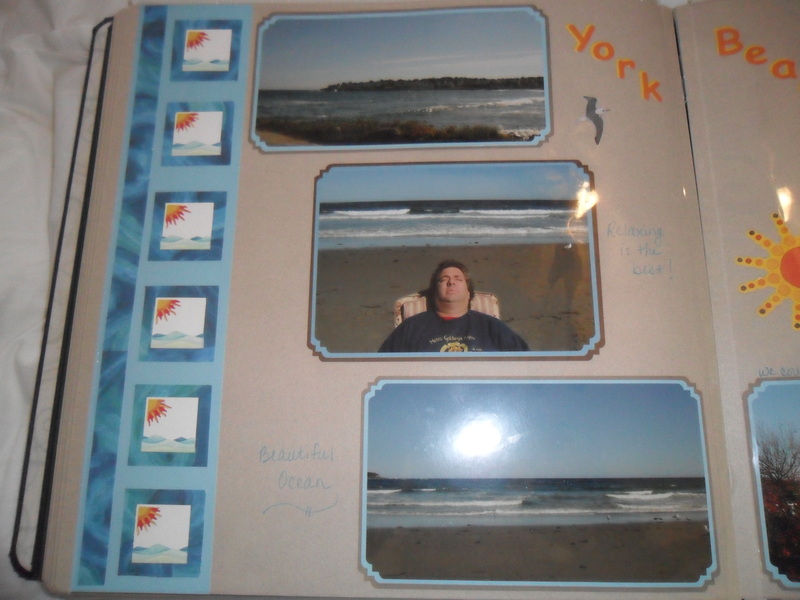 I arranged them as the picture shows; double mounted the photos in blue and dark brown – a nice combination for the natural colored pages. 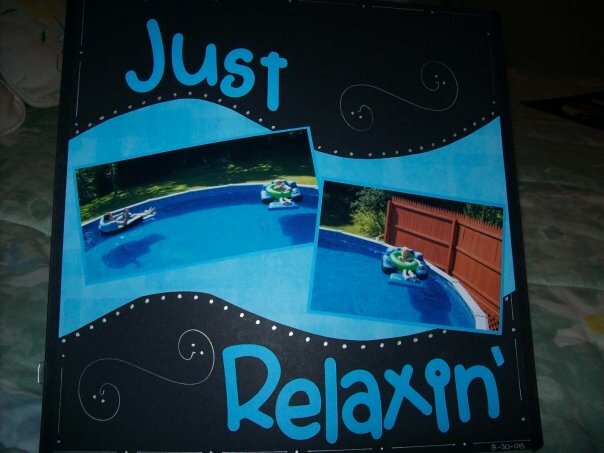 Another example from an on-line scrapbook class. Take strips of paper and fold back and forth to make pleats. A pretty neat look and an awful cute toddler! 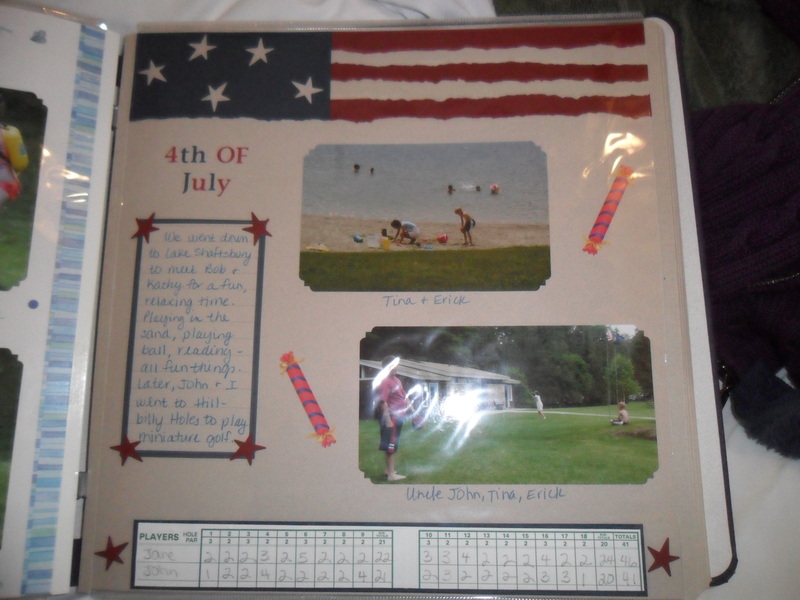 I wanted these pictures of my nephew Erick with his Uncle John to really stand out on a page. 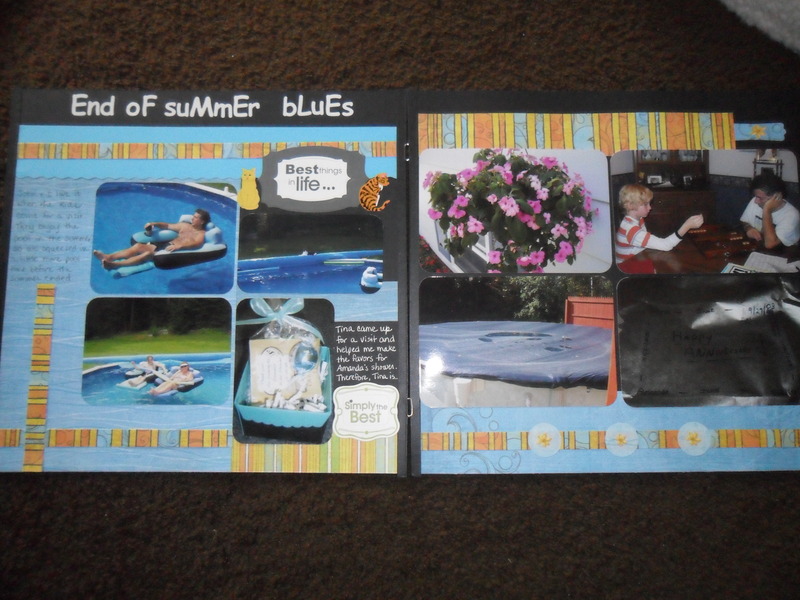 So I chose a black page and a bright blue designer paper and cardstock that I knew would make the pics jump out. I freehanded the cut – I used a pencil to draw the shape, then cut with scissors. I told myself it didn’t matter if it was the same size on both ends – just cut! Then I used a silver pen to draw a few swirls and the dots along the blue paper. Then I fired up my cricut for my title – this is the Making the Grade cartridge. Thanks for looking!